What is InstaSafe Secure Access? InstaSafe Secure Access (ISA) is an IT security and access management software that offers the tightest security through military-grade encryption, providing authorized personnel, stakeholders, partners, employees, and contractors encrypted access to applications via authorized devices only. It is designed and founded on the same principles that shape government network and device access in military and defense organizations, with access granted on a “need to know” basis. With InstaSafe Secure Access, users can access applications that are not on their network safely, regardless of their location and connectivity status as well as the location of the application. Equipped with the right authorization, users can securely access enterprise applications, whether deployed on-premise or in the cloud, whether on a public network or in a private cloud, anytime and anywhere. InstaSafe Secure Access boasts of securing your network, applications, and devices with top-class, military-grade encryption used by military organizations and defense departments. It means no unauthorized parties are able to breach and access anything without the proper permission and not through any unsecured device. In situations where confidential information needs to be shared or a top secret application needs to be activated or monitored, you can assign select individuals access as well as authorize specific devices through which access is allowed. The InstaSafe Secure Access requires you and your authorized users as well as your registered devices to be appropriately validated prior to reaching your firewall, shielding your applications, networks, and devices from attacks that use stolen passwords. You and those who have proper permissions access applications, even get to them simultaneously without being required to link to each location separately. Inbound firewall rules are not required to allow remote access, which greatly bolsters your security. Designated IT team staff can access applications and manage them remotely with fewer rules to make things less complex, which is great if there are application issues, updates, and changes that need to be done. What Problems Will InstaSafe Secure Access Solve? For many years, IT Admins have depended heavily on multiple directory services such as Active Directory®, LDAP, Radius, SAML, etc. to ensure that workforce is compliant to company policies. But changes in today’s business structure, particularly the advent and adoption of the remote workforce, make it difficult for companies to adhere to compliance standards as the directory services can only be implemented on On-Premise users. With InstaSafe® Secure Access (ISA), IT teams are empowered to make the remote devices join the corporate domain, simplifying the whole compliance process. Pushing directory services, like Active Directory®, LDAP, Radius, SAML, etc. and other such corporate group policies is no longer difficult. Many companies are now leveraging a multi-cloud architecture, mainly to reduce dependency, enhance reliability, steer clear from vendor lock-in, drive cost efficiencies, improve flexibility, and more. That said, making different cloud systems talk to each other is a very big issue and one that is difficult to address and resolve. This is because each cloud provider has its own set of protocols and adheres to their own native constraints. On top of that, many providers are not keen to simplify the integration with other cloud systems because there are hardly any incentives. Companies then have to perform complex process manually, like point to point deployment in each cloud, Command Line Interface (CLI) based network configuration, and more. 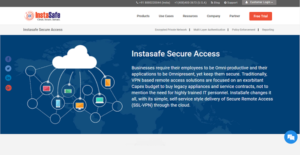 InstaSafe® Secure Access speeds up multi-cloud environments by giving users a point-and-click solution for connectivity between private and public cloud providers (including AWS, Azure, and Google Cloud). The complete inter-connectivity is handled securely, with just one gateway deployed in each cloud. Many enterprises leverage MPLS for the network connection because it offers benefits for scalability, traffic routing, and low latency. Despite that, once the MPLS goes down, the connection to a remote location is lost. To deal with this, InstaSafe® brings to you an MPLS Failover Solution, that protects business continuity with Multi-WAN connectivity and an auto and truly seamless failover functionality to ensure maximum connectivity and minimum service interruption. Companies have unique wants and requirements and no software solution can be just right in such a condition. It is futile to try to find a perfect off-the-shelf software app that meets all your business requirements. The smart thing to do would be to adapt the solution for your unique needs, worker skill levels, budget, and other factors. For these reasons, do not hasten and invest in well-publicized trendy solutions. Though these may be widely used, they may not be the perfect fit for your unique wants. Do your groundwork, look into each short-listed application in detail, read a few InstaSafe Secure Access reviews, call the seller for explanations, and finally choose the app that provides what you require. How Much Does InstaSafe Secure Access Cost? We realize that when you make a decision to buy IT Security Software it’s important not only to see how experts evaluate it in their reviews, but also to find out if the real people and companies that buy it are actually satisfied with the product. That’s why we’ve created our behavior-based Customer Satisfaction Algorithm™ that gathers customer reviews, comments and InstaSafe Secure Access reviews across a wide range of social media sites. The data is then presented in an easy to digest form showing how many people had positive and negative experience with InstaSafe Secure Access. With that information at hand you should be equipped to make an informed buying decision that you won’t regret. Wonderful using this Product. Good that they take continuous improvement efforts. What are InstaSafe Secure Access pricing details? What integrations are available for InstaSafe Secure Access? Interestingly their product works with all type of infrastructures. I am more than happy because it could solve Remote Access issues and AD extension as well. If you need more information about InstaSafe Secure Access or you simply have a question let us know what you need and we’ll forward your request directly to the vendor.